CLEVELAND -- There has been a certain buzz around the Boston Celtics since late August, when the team completed the league-wowing swap that delivered Kyrie Irving to Boston. The Celtics paid a hefty price to add a pair of All-Stars this summer, but there was a palpable energy around the team that centered on what might be possible with both Irving and prized free-agent signee Gordon Hayward at the top of a new-look roster. It took only five minutes, 15 seconds of regular-season action to wonder if all of Boston's lofty aspirations had been dashed. Quicken Loans Arena went silent at the sight of Hayward grasping at his mangled left ankle, his foot turned at such a gruesome angle in front of the Cavaliers bench in the first quarter of Tuesday's season opener that Cleveland players sprinted from the bench to avoid looking at it. If not completely shellshocked from the loss of Hayward, Celtics players could have been forgiven if they started to wonder if a season of opportunity had been spoiled. But once Boston collected itself, it showcased a resiliency that looked an awful lot like the spunky teams of recent seasons that have done their best to push the Cavaliers. If not for some familiar LeBron James late-game heroics and one very big 3-pointer by Kevin Love, the Celtics might have found a way to escape Tuesday night with an improbable win instead of a 102-99 loss. 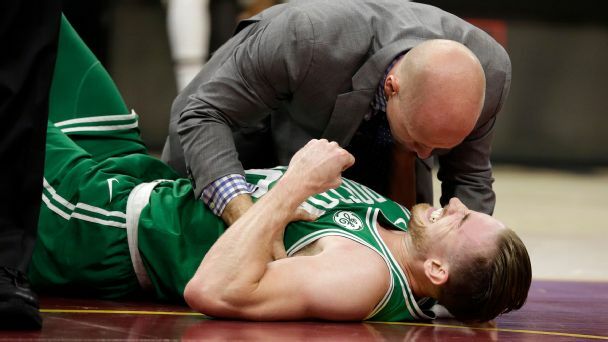 What Boston can cling to, beyond the hope that surgeons will soon be able to start Hayward on a speedy path to recovery, is that this team is still equipped with enough intriguing parts to hold the fort while Hayward recovers. "When you get hit with adversity there's two ways you can go -- either forward or backwards," Boston's Jaylen Brown said. "Tonight we chose to go forward." Brown dazzled while playing a team-high 40 minutes. The second-year forward had started to emerge during last season's run to the East finals. Thrust into a starting role to start his sophomore season, he looked like a player ready to make a leap. Brown dueled at times with James and finished with a career-high 25 points on 11-of-23 shooting. He missed a potential overtime-forcing 3-pointer with two seconds remaining, but Irving made sure to implore Brown to be fearless in that sort of situation. "We had a great look with JB on the first one. A young guy trying to take a good shot like that at the end, with [two] seconds left on the clock, that takes some big guts," Irving said. "So I went up to him and told him after that, 'Do what you need to do in order to mentally get over this one but now we got another game tomorrow that we have to get prepared for.'" The 20-year-old Brown (his 21st birthday is next week) wasn't even Boston's youngest starter on this night. That honor went to 19-year-old Jayson Tatum, the No. 3 pick in the June draft. With Marcus Morris sidelined by knee soreness, Tatum got the opening-night nod. He hit some initial bumps (including getting swatted early by James) but settled in to put up 14 points on 5-of-12 shooting with a team-best 10 rebounds. "Jayson was pretty good," Celtics coach Brad Stevens said. "He can play better, but I thought he did a pretty good job for the first game. That's pretty hard to do -- thrown into this environment in your first game, starting, to play that well." Added Brown: "Jayson is a special talent, and we're going to need to see it from him this season, especially with Gordon going down. He'll have to step up, but Jayson will be all right." Brown was asked if it's on him and Tatum, fast friends since the summer, to carry Boston forward without Hayward. "I just think it's on the team," Brown said. "We have to come together and play. We have a great coach in Brad Stevens so, at that point, it's play for each other, play the game the right way, and we'll be fine." There were other encouraging glimpses: Veteran big man Aron Baynes provided some grit off the bench; newly slimmed Marcus Smart feasted on Kyle Korver in the post to spark a third-quarter rally, and Al Horford did all his usual below-the-radar things to make the Celtics a better team when he was on the floor. Even Irving would like another chance at his buzzer-beating 3 that could have forced overtime. He finished with 22 points on 8-of-17 shooting while fighting the obvious emotions -- downplay them as he tried -- of playing his former team in the first game of the season. From the business side, ESPN Front Office Insider Bobby Marks notes that the Celtics will be able to apply for the disabled player exception. That would give them up to $8.4 million to pursue a player before March 10. With an open roster spot, the Celtics can sign, claim or trade for a player with one year remaining on his contract. The Celtics operated with only 11 available bodies for much of opening night (rookies Daniel Theis and Abdel Nader were healthy DNPs). They'll get a boost when Morris is able to return. Rookie Guerschon Yabusele missed Tuesday's opener because of an illness. Even with a healthy Hayward, many wondered if the Celtics would be too green to be competitive with the Cavaliers in the first game of the season. Considering the circumstances of the night, Boston showed some serious fight. That's sometimes easy to do in the immediate aftermath of a major injury. Now the Celtics must find a way to harness that energy. Without Hayward, the path to Boston's loftiest goals got decidedly more bumpy. But this team is no less intriguing, and the development of its youngest players in Hayward's absence could accelerate its ability to be truly competitive further down the road. The buzz is not gone in Boston.